I recently worked with a client on a presentation concerning the Deepwater Horizon disaster – an epic tragedy in 2010 that claimed the lives of 11 men, injured 17 others and poured 4.9 million barrels of oil into the Gulf of Mexico. The financial costs to BP have totaled about $60 billion, not counting the long-term loss of more than a quarter of BP’s market capitalization. It remains the worst off-shore oil spill in US history. Revisiting the details of what happened, and why, was both tragic and fascinating. It was a reminder that despite all our technological prowess and cutting-edge this-and-that, the forces of nature are humbling. Even when those forces are in the form of long-dead dinosaurs buried 5 miles under the sea. It is also a reminder that catastrophes like this are almost never the result of a single point of failure: usually multiple safety systems, human and otherwise, fail in an event of this magnitude. The Deepwater Horizon disaster began on April 20, 2010, at approximately 9:38 pm CDT, when the Macondo well began surging hydrocarbons into the drill riser. The reverse flow of drilling mud, gas and oil started slowly, then erupted into a geyser that ignited and burned for two days, ultimately sinking the Deepwater Horizon. The task of the Deepwater Horizon, a giant floating ship in the form of a drilling platform, was audacious. Owned by Transocean, the Deepwater Horizon was tasked with drilling the Macondo well, leased by BP. The drilling took place about fifty miles off the coast of Louisiana, at an ocean depth of a mile. But the prize – a vast potential reserve of oil and gas – lay much deeper; about three-and-a-half miles under the sea floor. The operators were drilling four-and-a-half miles beneath them, into an ancient world that they could never see. The task of drilling the well was complex and tedious. It involved repeated cycles of installing lengths of drill pipe – almost five miles’ worth – to achieve the desired depth. During the drilling process, a combination of seawater and specially formulated drilling “mud” was pumped through the drill bit to remove debris and to keep the well pressure at appropriate levels to prevent hydrocarbons from flowing up into the well bore. Along the way, at various intervals, drilling was stopped and the well bore was “cemented in” with steel casing. The cementing process was critical – if the cement failed, hydrocarbons could leak into the annulus – the space between the drill pipe and the casing – or potentially into the casing itself, leading to a blowout. 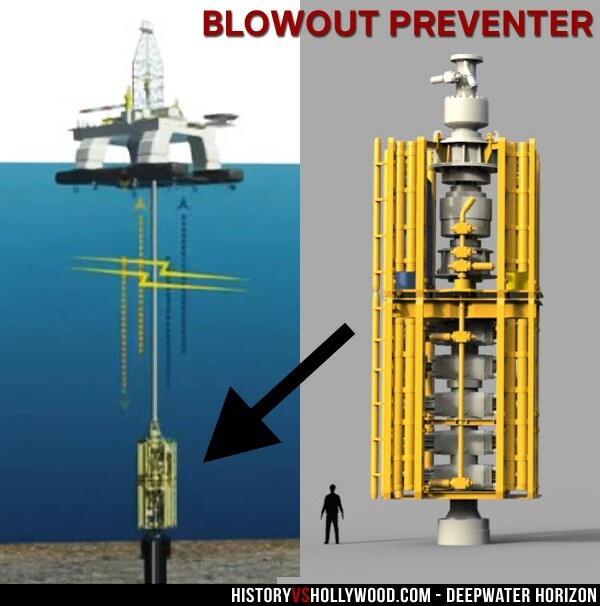 A blowout preventer (BOP) supplied by Cameron was thought to be the ultimate failsafe. 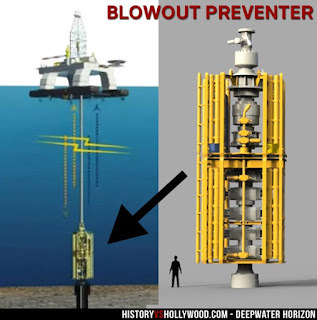 More than 160 feet high, the BOP sat on the sea floor and had multiple systems intended to seal the well and prevent a blowout. They included an upper annular closure, a lower annular closure and a blind shear ram. The annular closures were designed to seal around the drill pipe. The blind shear ram was a hydraulic ram of last resort – a set of cutting blades designed to cut through the steel drill pipe and seal the well entirely. The BOP even had two “dead man” switches – intended to operate the blind shear ram in the event of a loss of hydraulic power, electricity and communications. All of this technology ultimately failed. At the time of the disaster, the Macondo well was in the process of being temporarily “abandoned” by the Deepwater Horizon. Having drilled the well, the Deepwater Horizon’s final job was to seal it with concrete and leave for its next drilling job. When BP was ready to produce oil and gas from the well, it would send in a production platform to reopen the well. But the Macondo well had been a problem for BP and Transocean. Multiple delays and unforeseen issues had put the project more than 50 days behind schedule – at a cost of $1 million per day to BP. Workers had reportedly named it the “well from hell.” As they were preparing to leave, things got worse. Because the well was being drilled in relatively weak geological strata, BP and its cementing contractor Halliburton elected to use a lighter “foamed” cement in the lower portions of the well. The final step was to pour a concrete plug or cap at the bottom of the well using a stronger and heavier liquid cement. Multiple investigative reports suggest that the foamed cement failed, and that the heavier liquid cement never made it to the bottom to plug the well. Despite questionable results from a negative pressure test intended to determine whether the well was properly sealed, officials on site decided the well integrity was satisfactory, and operators began the process of removing the heavy drilling mud and replacing it with seawater. At that point, hydrocarbons began flowing up through the casing, through the BOP and up into the riser at the surface. By the time the crew realized what was happening, the Deepwater Horizon was enveloped in a cloud of combustible hydrocarbons. A methane detection system sounded an alarm, but only shut down some of the potential ignition sources. Gas – odorless and colorless – entered the air intakes for the massive diesel engines that powered the Deepwater Horizon. This initially caused the engines to overspeed – popping light bulbs and overpowering the electrical system – and then stop. Seconds later, explosions occurred on two of the generators, igniting the firestorm that ensued. Each of these issues is detailed in the BP report (and others), and other investigative reports emphasize or de-emphasize particular aspects. 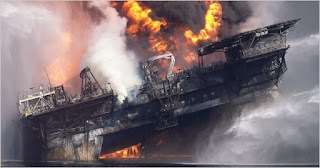 But it is undisputed that the Deepwater Horizon catastrophe was a result of multiple failures – system, technological and human. Families lost loved ones and many others were scarred by the events. The recent Deepwater Horizon movie was based on a New York Times article that detailed some of the heroics and human toll. Seven years later, BP is still fending off lawsuits – at this point, primarily actions by institutional shareholders relating to alleged securities violations. Multiple environmental assessments have detailed the impacts to the Gulf of Mexico. The financial costs to BP and other involved parties have been staggering. The history of human technological progress is one of spectacular advances and catastrophic failures. As we continue to race forward at breakneck speed, it is critical and humbling to reflect on events of the past -- in the hope that future catastrophes can be avoided or minimized, but with the painful awareness that we will likely have future lessons to learn.